Definition at line 206 of file cmocka.c. 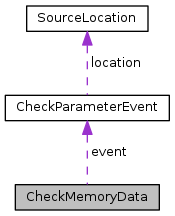 Definition at line 207 of file cmocka.c. Definition at line 208 of file cmocka.c. Referenced by check_memory(), check_not_memory(), and expect_memory_setup(). Definition at line 209 of file cmocka.c.